capital is home to innumerable museums, especially the National Palace Museum, parks, and ancient temples displaying the accomplishments of this tenacious nation. Food lovers will want to head out to the Shilin Night Market to taste outstanding Taiwanese food. For a landscape that was once dominated by Soviet-era concrete apartment buildings set up to provide a home for refugees, Taipei has come a long way. The skyline of Taipei is modern and skyscraper-laden, capped off by the imposing presence of Taipei 101, the world's second-tallest building. In addition to the modern architecture, Taipei has the wonderful distinction of being one of the safest cities in the world. it a good off-season alternative, and the Chinese New Year and Lantern Festival in January and February are fun celebrations to participate in, but beware the elevated hotel rates and occupancy. Both spring and fall are ideal, with mild temperatures in the 70s and low 80s (21-30C), less rain, and plenty of happenings. Ghost Month, complete with parades, costumes, and plenty of incense, begins in August or September, depending on the year, and in March, the cherry blossoms are in bloom. Taiwan remains largely undiscovered and seriously underrated by Western travellers, but those that make it here are in for some real treats - sensational food, traditional Chinese, aboriginal festivals and exuberant temples, yet the biggest surprise is Taiwan’s hinterland: think towering mountains, eight national parks, a selection of alluring offshore islands and numerous hot-spring resorts. One of the most endearing things about the island is the overwhelming friendliness of its people – Taiwan is one of the most welcoming countries in the world, and you are bound to encounter numerous acts of generosity or kindness throughout your travels, whether it’s a taxi driver rounding down a fare, a stranger helping with directions or a family providing a bed for the night. Eating in Taiwan comes a close second, with a vast array of Chinese food and local delicacies on offer. Travelling around the island is relatively straightforward, though the lack of English can make things a challenge at times, particularly as most timetables tend to be displayed solely in Chinese. Getting around Taipei (capital of Taiwan), is relatively easy. The subway in Taipei starts operating at 6am and is open until midnight, the lines of Taipei Metro have a radial arrangement and they usually circulate from the centre to the periphery – just remember to download the Metro map before your trip and you are ready to go. 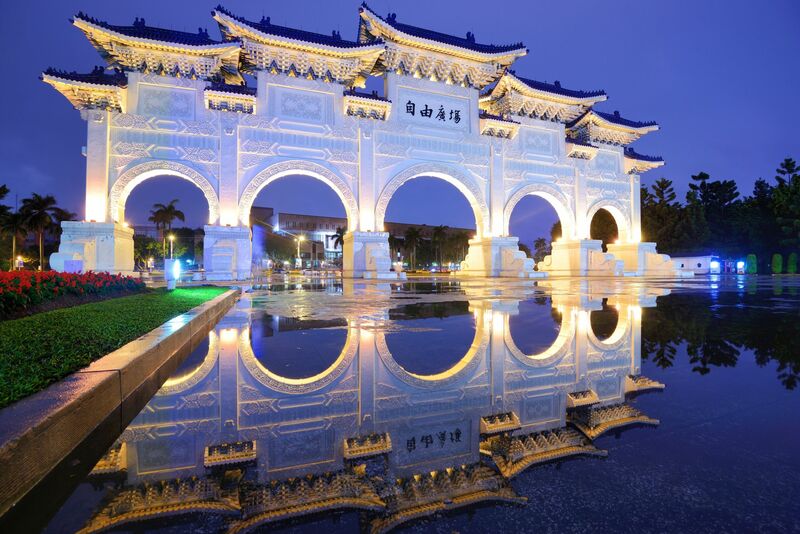 Most people prefer to visit Taiwan starting from the famous Taipei 101, the National Palace Museum. However as a shopaholic myself, I usually prefer to start with night markets – Shilin Night Market, Raohe Street night market, Ningxia night market, Feng Chia night market and Yizhong street night market. If you do not have time to visit all of them, probably you can start with the biggest and famous night market first. Probably the biggest, night market in Taiwan. It is also the typical image of all-night markets. Easy accessible from MRT Jiantan station (Red line), and is always very crowded. The foods there (especially in the market area), however, are so-so and tend to be more expensive. Go to the street area beside for better food. If you are unfamiliar with the night markets in Taiwan, it’s still the best place to go. It can give you an idea of the looks and the tastes of many typical Taiwanese night market snack foods. Warning: don’t buy chopped fruits; they will completely rip you off. Definitely a “must go” place in Taichung, tons of shopping and good food around. This night market is located beside a university, making the things there cheaper as compared to other night markets as they cater more to the students there. Located along the riverfront in Tamsui (Danshui), Tamsui Old Street is a boardwalk-like area full of shops, carnival games, restaurants, cafes, and snacks. The waterfront area is a great place to watch the sunset over the Tamsui River. Vendors will generally start in the afternoon and stay open until the last MRT train at 12 midnight. Taipei 101: a place for first time travelers. Taipei 101 and nearby areas are good for first time travelers. It is also good for shopping and tax-return products. Taipei is really a foodies heaven with so many different types of casual fares in its many night and day markets. Taipei seems like it would meet all of your needs. I've lived in Taiwan for almost two years now, including a year in Hsinchu and several months in Tainan, along with short trips to Taichung, Hualien, Pingtung and other cities, and I've recently relocated to Taipei to take advantage of its versatility and accessibility. Taipei makes the perfect base for any lifestyle, whether you like to live it up in the city, maintain a quiet and simple life in a comfortable home, get away into nature, climb mountains, surf, travel, immerse yourself in local culture or connect with an international scene. The locals are exceptionally warm and welcoming, as well as famously food-obsessed; you will never run out of things to eat in Taiwan! It's also one of the most vegetarian/vegan-friendly places in the world, with many of the country's large Buddhist/Taoist population restricting animal products for religious reasons. There are tons of vegetarian and vegan restaurants offering 100% meat-free dining (with some really creative meat alternatives, too). Regular restaurants are much more conscious of and sympathetic to their customers' dietary requirements. Taiwan is incomparable in its convenience - as a former Japanese colony, it's received a lot of Japanese ideals of efficiency and customer service, but maintains this convenience at a much lower cost than Japan. Taiwanese people hate inconvenience the way cats hate water. The island is tiny and has a fantastic system of railways and highway buses, so you can get anywhere you want in just a couple of hours. It's also in the middle of Asia, so you can fly to anywhere in Asia quickly and cheaply. Taiwan has the highest density of convenience stores in the world, offering everything from fresh-brewed lattes and ready-to-eat foods (including healthy options like salad, hard-boiled eggs and fresh fruit) to thermal undershirts, stationery, cellphone chargers, imported wine, birthday cakes, comfortable seating areas, free bathrooms, and super-cheap one-day home-delivery services. You can get anything you need, anywhere, anytime. The locals place a high value on speaking English, and many people live here for decades without learning Chinese (although I strongly discourage this - it's both disrespectful and a terrible waste!). Connectivity is easy - Taiwan is an IT hub, and it also has some of the highest rates of smartphone usage in the world. People here are notorious tech addicts and it's difficult to find a place that DOESN'T have wifi - I've even found wifi hotspots on hiking trails and mountain tops. You can take advantage of the government's free public wifi program or you can do what most locals do and get a cheap unlimited 4G phone plan and share your personal wifi hotspot with all your devices (my plan costs me about 500NTD or 16USD per month). There's a thriving culture of independent/amateur computer engineers, app developers and "digital nomads", and the government is encouraging innovation and startups to fuel their IT economy. You can buy all the electronic devices you need easily and cheaply, and you don't need to worry much about dodgy fakes and knock-offs, because there's no market for them in this tech-savvy environment. Also, it doesn't have any of the media restrictions of mainland China; you can freely access and publish any kind of media here. Any city in Taiwan will be easy and convenient to live in, but not all of them have decent local transportation - if you want to live car-free, Taipei is the best choice. It's a compact little metropolis located in a mountainous region at the junction of two rivers just an hour or two from the coast, with a high-speed MRT system that reaches deep into the suburban and semi-rural parts of the city, giving access to hiking and camping without any personal transportation. You can literally go from shopping at Gucci in Zhongshan to hiking up a mountain in or soaking in a wild hot spring in under an hour. Bike trails run the length of the rivers, and there's a public bike-share system similar to those in New York and Paris (but much, much cheaper!). Taxis are cheap and plentiful and will happily drive you to a remote location hours away if you settle on a fair price with them first - you can even arrange for them to pick you up later. The cost of living in Taipei is much higher than elsewhere in Taiwan, but its convenience makes it worth it; anyway, it's still a lot cheaper than living in North America or Europe. This city has so much life to it! There are so many things to do and if you are a foodie like me, you will be in heaven. They have these street carts full of different kinds of foods that will change you (thats how good they are). I really enjoyed their sweet milk tea. I would honestly go back just for the tea! What's not to love about this wonderful city? My parents are from here and I spent eight awesome years living in this great city! There is so much to do, and most importantly, LOTS TO EAT! The island is beautiful if you go to the right places, and people are friendly and love their food. The night markets are really that great and the food is cheap and delicious!